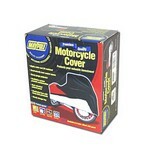 Motorcycle cover from Maypole. This top of the range deluxe bike cover offers great value for money, featuring Heat resistant panels and vents and complete with a handy storage bag. Large fits motorcycles up to 2300mm long.